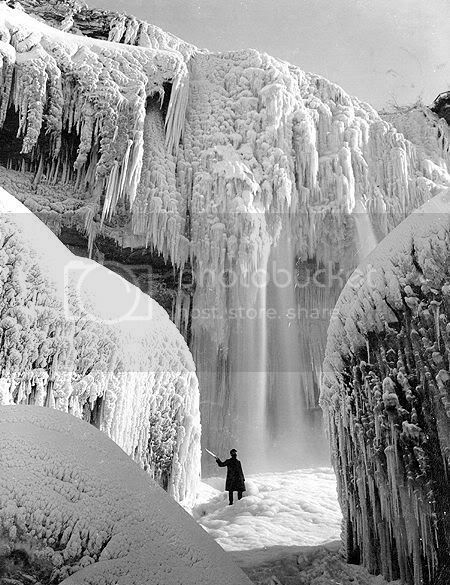 Vinatage photos of a frozen Niagara Falls. The American Falls have frozen over on six occasions since the keeping of records began. Each were attributed to ice jams that have actually curtailed the flow of the American Falls to mere trickles. Unlike the Horseshoe Falls (which has never frozen over), the American Falls are susceptible to freezing because of the small amount of water flow. Normally the American Falls has a peak mean flow of 10,000 cubic feet of water per second. The winter mean water flow is reduced to less than 8,000 cubic feet of water per second. This minimal flow is barely sufficient to cover the rock face of the Falls. During harsh winters, ice frequently built up at eastern end of Goat Island causing an ice dam to reduce the water flow to the northern channel which feeds water to the American Falls. As a result water flow is restricted sufficiently that any remaining waters quickly freeze over. The installation of the ice boom at the mouth of Lake Erie, the building of the International water control dam (which regulates water flow) and milder winters have all but eliminated the possibility of the American Falls ever completely freezing over in modern times. 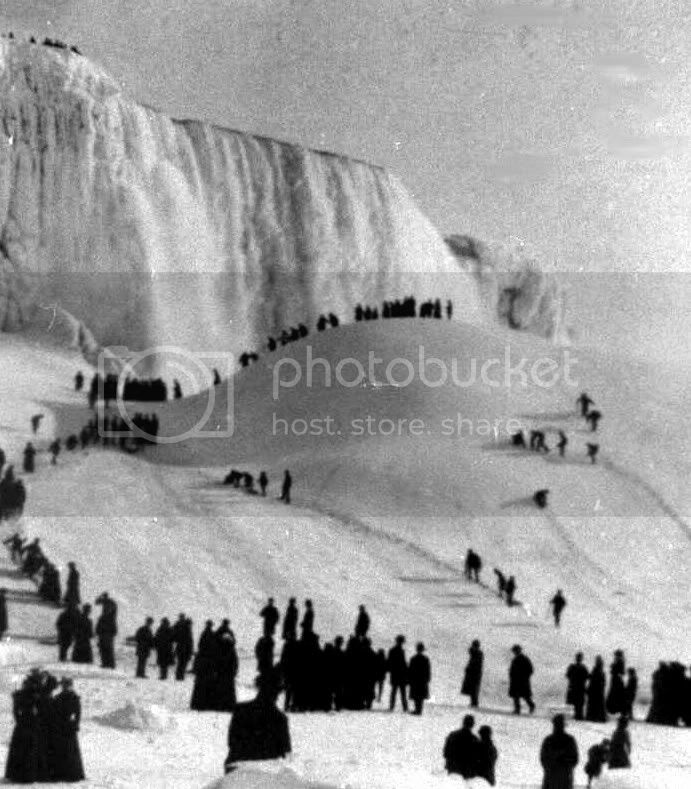 On February 7th 1936, as a result of an ice jam at the eastern end of Goat Island the American Falls froze completely. The flow started to freeze on January 27th. The American Falls remained frozen for a period of 15 days before the ice dam upriver broke apart and returned the flow of water of the Falls to normal. The American Falls today receives only 10% of the total water flow. In the early 1900’s that flow was much less, perhaps only 5%. The low level of water flow was amplified because of the beginning of water diversion for hydro generation and the lack of a method to divert water towards the American shoreline. The riverbed above the Falls slopes towards the Canadian shore. 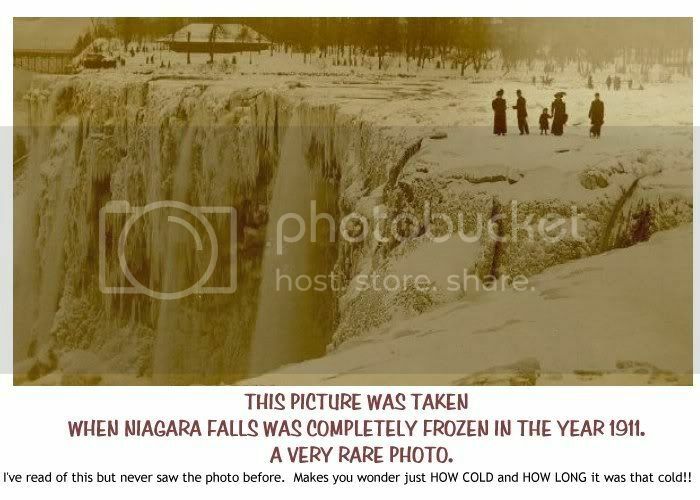 Long before the ice boom was utilized at the mouth of Lake Erie to hold back the lake ice, all the ice flowed through the Niagara River. The amount of ice flowing into the river depended upon winds blowing over the lake. West & south-west winds brought more ice flow into the river while east winds would lessen the amount. The April 1909 ice flow was sufficient to dam off the flow of water at the eastern end of Goat Island. What water was left (a mere trickle) quickly froze. People were able to walk on the river bed just above the American Falls where there was normally water. It wasn’t until the ice jam shifted and broke apart, that the water flow was returned to normal. A second similar ice jam occurred in January of 1938. 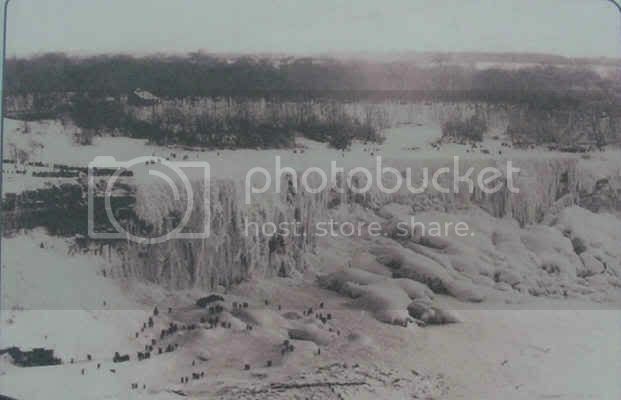 The ice jam was so substantial that it too cut off the main flow of water to the American Falls. Again the American Falls was reduced to a trickle and quickly froze. More importantly, it was this ice flow that caused the collapse of the Upper Steel Arch Bridge (Honeymoon Bridge). Next Next post: Gatorade will destroy your teeth faster than soda.